Summer training camp has commenced, preseason games are nearing their finish and Week 1 of the 2015 NFL regular season is now just two weeks away. As usual, the defending Super Bowl champions will play host to the league’s season-opener and this year features a doozy. The likely Jimmy Garoppolo-led New England Patriots will take on the high-octane offense of the Pittsburgh Steelers on Thursday, Sept. 10 at 8:30 p.m. The Patriots, of course, have had an off-season like no other team in the league; mostly due to off-the-field mayhem stemming from “Deflategate.” Really, the past six-plus months for New England is something that is perhaps unprecedented in the NFL’s history. Since we’re nearly through the summer – which sports fans who stick to following just football sometimes find tortuous – it’s time to dig deeper into the Patriots regular season schedule. Along with the Patriots first test of the year, there are three other highly intriguing match ups on the 2015 slate. These games were chosen for this post due to a bounty of reasons including the typical successes of both franchises competing, player rivalries that will be on display and well, Week 6 will speak for itself. 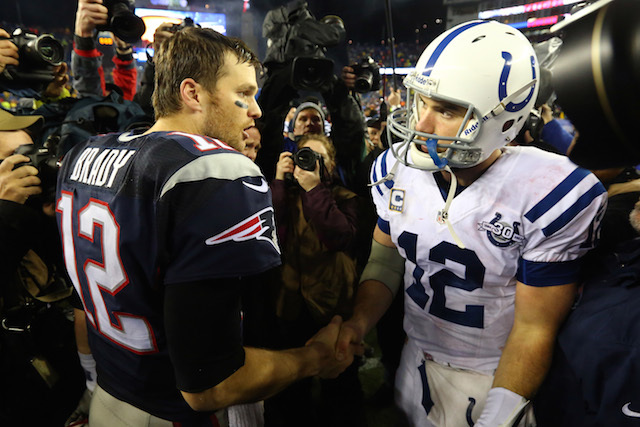 The NFL schedule-makers did a terrific job in selecting the Patriots opening opponent. True, both the Steelers and Patriots will be without their top running backs (Le’Veon Bell and LeGarrette Blount respectively), due to suspensions, but this game has plenty of other juicy plot lines. The very different looking Pats secondary – which has caused some excessive worrying from New England fans – will have a huge battle in this one. Without Bell in the backfield, expect veteran quarterback Ben Roethlisberger to have a field day with his favorite target, and arguably the best wide receiver in the game in Antonio Brown. When the Patriots are on offense, barring a last minute change in court, Tom Brady will not be suiting up. This will be Garoppolo’s first experience as an NFL starter and he’ll be doing it in the national spotlight at Gillette Stadium. Wow, what on Earth won’t this game have? Brady’s (likely) first game back. AFC Championship rematch. The “cheaters” vs. the “tattle-tales.” AFC contenders going at it. Andrew Luck’s ascension into the “best current QB” discussion. Reggie Wayne‘s return to Lucas Oil Stadium. Sunday Night Football. In another prime timer, the Patriots will welcome the division-rival Buffalo Bills to town for a Monday Night Football showdown on November 23. The new-look Bills enter 2015 as likely the best competition for New England’s grasp on the AFC East and by Week 11, we should have a good idea of what they are made of. While their defensive backs may struggle at times this year, many football analysts have praised what the Patriots have put together on the defensive line and in their linebackers corp. This should be one of their biggest challenges of the season as they will try and stop the Bills new running back, LeSean McCoy. The week leading up to this game will surely be entertaining as well, as polar opposite head coaches Rex Ryan and Bill Belichick prepare. This year’s “Brady-Manning Bowl” comes in Week 12 and will take place on Peyton Manning‘s home turf at Sports Authority Field at Mile High Stadium. Barring injuries to either of the future hall-of-fame quarterbacks, this game will again produce “mile high” ratings for NBC. This is the fifth and final prime time game on the Patriots schedule and should again produce drama and intensity. 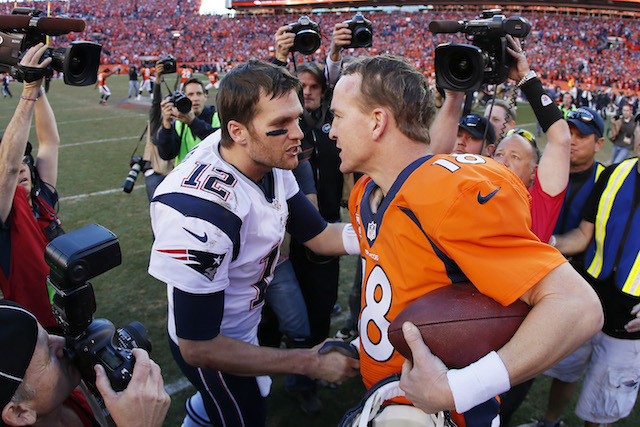 This is the only regular season game between these two perennial AFC contenders, so unless they meet in the playoffs, could this be one of the final times we witness Brady vs. Manning? Only time will tell. Scheduling information is courtesy of NFL.com.